It has been a grueling training regiment at the Academy, but you're finally ready for your first mission as a full-fledged T.I.M.E agent. You and your team will travel back (or forward) in time to prevent some cataclysmic event. But don't waste a moment… every second counts! Each T.I.M.E Stories deck is a new scenario waiting to be discovered! Unique time travel mechanic allows you to relive past events. Each deck of cards is a new adventure to play. Beautiful artwork fully immerses you in each different scenario. Base game includes the Asylum scenario. T.I.M.E. Stories is a hybrid storytelling/board game, placing the players into the roles of temporal agents, working for the Tachyon Insertion in Major Events (T.I.M.E.) Agency. In a manner similar to the old Quantum Leap TV show, the players are projected through time to inhabit the bodies of others in the targeted time period, and must work together to complete a mission. 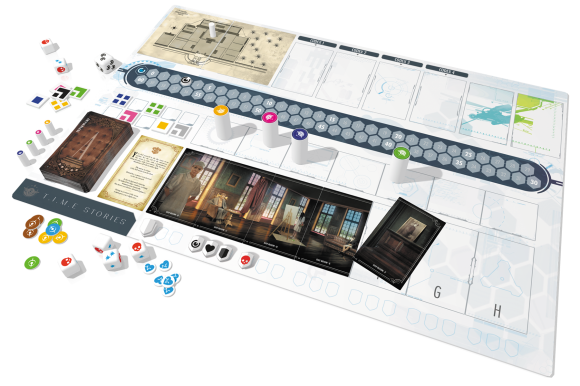 Each “receptacle” (the others being inhabited) has different skills and possible other abilities or items to start, similar to a game of Arkham Horror. The game setup involves a Scenario deck, comprised of Locations, Items, win/lose conditions, and a “Plan” (the known surroundings of the time projection), which may change as more of the area is explored. Players move as a group, and are invested in resolving the central problem of the Scenario. Upon entering one of the Locations, the cards for that location are removed from the scenario deck, and fanned out onto the gameboard in a particular order face-down, comprising a visual scene which the players may explore. Each player moves his pawn above one of the location cards to explore that part of the panorama, then the players at each location pick up and read the other side of the card. Some may offer visual or text-based clues, some may offer item cards (retrieved from the scenario deck by number), and some may offer tests (roll-based, compared to stats on the receptacle card). Every player decides on their action within the location (attempt the test, move to another card within the location, do nothing), then one or more Time Units (TU) is expended to complete the action. While most tests can be walked away from if not succeeded, certain ones will lock a player in, requiring that the test be passed before that player can do anything else. Tests require a specific number of successes to be rolled on the Action Dice, and most tests allow players to cooperate to complete them. Some will yield more clues or items, while others are red herrings — time sinks that will do nothing but eat up the party’s TU. Certain tests are more rigorous than others, with the potential to cause damage to a receptacle or eat up TU if the skull (undesired result) is rolled on one or more Action Dice. When the group decides together that they have spent enough time exploring a location, they can move to a different location on the Plan by expending 2 TU, removing the cards for the previous location, and then laying out the cards for the new location, whereupon the exploration cycle repeats. Some locations will have locked areas, requiring that the players complete a task or find an item in some other location to get the State Token (a tile with a distinct color/pattern combination) to unlock that area. As they progress, they may learn about areas not shown on the starting Plan map (represented by item cards which overlay a sector of the Plan), allowing them to access other Locations within the Scenario deck. If the players cannot decide unanimously, they hold a vote to determine the next party course of action (which location to explore next, for instance). The party is granted a certain number of Time Units to complete their mission. If they fail by running out of TU, or their entire party is killed (difficult, as there is a limited resurrection mechanism built into the game), they read the Mission Failed (TU) card, which explains what steps to take next. Players are not expected to necessarily complete their mission on the first try — fortunately, since the game has a central time travel theme, they get to go back and try again, able to select a different receptacle (if the first one was not a good fit), and armed with the knowledge of all the secrets uncovered on previous attempts. On a second run-through, the party should be able to remember the pitfalls of the prior run, avoiding any time-sink tests and knowing where to go to pick up certain State Tokens. A mission reset changes the parameters of the Scenario slightly (the team might get more TU to work with on a subsequent run, for instance), but as this is a cooperative game, how quickly (and in how few runs) you can complete the scenario decides how well you’ve collectively done. The game has some beautiful artwork in its scenarios and base T.I.M.E. Agency cards. Its design is deliberately minimalist: the board is a staging ground for the specific parts of the scenario, with an area to lay out the Plan cards, spaces for Item and Location cards, and a line of spots to lay out the location panorama. There are markers for the individual party members as well as the group as a whole, shield tokens to represent tests to be completed, a variety of resource tokens which can change function from scenario to scenario, and the array of various state tokens. With such perfect modularity, general gameplay will remain unchanged, and players can swap out scenario decks to get a whole new experience. As a game, T.I.M.E. Stories is actually fairly light. The rulebook anticipates that each “run” of a mission will take about 90 minutes, and much of it will be exploration and clue-gathering. In that sense, it’s like a group version of Choose-Your-Own-Adventure, with some decisions potentially leading to bad ends. The theme of the game makes the idea of repeated runs fun, though in that sense it’s very much like exploring a video game level and having a save point from which to restore if things go south very quickly. This is particularly amusing considering the game’s packaging has a literal means of creating a “save point” if you are unable to complete a single run in one session, using areas of its segmented plastic tray to store specific information regarding what you’ve discovered, how many Time Units you have remaining, and what damage your receptacles may have taken. In this, it is an interesting design. The base game costs $50 at retail, which is a bit pricy considering the entire run-through is about 5-6 hours with zero repeat value out of the box. The campaign effect of the game, however, means that you can substitute in any $30 expansion scenario (as of the time of this writing, two are available: The Marcy Case and A Prophecy of Dragons) and get another several sessions out of it. When you consider that the base game’s Asylum 1921 N.T. scenario is virtually identical to one of those expansions, the $20 spent for the spare but versatile components of the base game doesn’t seem all that bad. Even if the cost is an issue, it could be split among a dedicated group of players. I think this game lends itself beautifully to any gaming store that runs a game rental option, as each scenario has virtually no replayability for the same group once completed, but multiple groups could make good use out of it (though they would need to figure out a way to separately record any “save point” information given a shared box). Despite the game claiming to work with 2-4 players, I think this is a game that doesn’t scale well. Given the rules surrounding group movement, a smaller party would be a liability and the number of runs required to complete a scenario would likely increase. It is fun within its limitations — this is not a strategic game, it is a cooperative exploration game. There is a negligible element of role-playing, but the campaign structure of the game does have the feel of a tabletop RPG. Overall, it’s an entertaining experience — not as irreversible, one-time-only purchase as the “Legacy” class of board games; modular enough to support an infinite variety of scenarios, but not replayable within those scenarios, at least by the same group. I feel like a “naked” version of the base game could be sold to allow someone to start with whatever scenarios they see fit, though selling a “console” without a “game cartridge” to play on it probably doesn’t work at the retail level. Can recommend giving it a try, but definitely discuss with your regular playgroup the dynamics of how you will bear the costs of the game. T.I.M.E. Stories is a bit difficult to classify. Is it a board game? Kind of, but it’s not strategic or tactical, with few mechanics and moderate luck. Is it a roleplaying game? Possibly a very light one, but there’s no leveling outside of finding items and no character customization. Is it a storytelling game? While the story is definitely the selling point, there’s a lot more going on than a standard choose-your-own-adventure. So what classification fits it best? For me it’s video game. I left the digital game world behind a decade ago so my references are dated, but this is much closer to my PS2 favorites – well-known titles like Resident Evil and Silent Hill (the Asylum scenario included with the base game is particularly Silent Hill-y) as well as lesser-known games like Fatal Frame and Shadow of Destiny (my all-time favorite video game, and like T.I.M.E. Stories built around the central theme of time travel). The following is about the game system, with no scenario spoilers. Set up of any T.I.M.E. Stories scenario takes 2 minutes – you place the board, dump some tokens around it, place the scenario’s deck and you’re off. However, character selection – which is part of set up in other games – is moved to gameplay here, and it can cause games to start a little slow as you analyze options and build a balanced team. Play time varies – the number of actions players can take in the game is determined by a given scenario’s “temporal units” (TUs), and while the board supports up to 60 TUs, scenarios can use as little as 25. A 25-TU scenario takes around an hour for one “run” (you’ll almost certainly need more than one run to complete a scenario), while a 60-TU run could go well over two hours. When you factor in the number of runs you’re likely to need to complete the story, you’ll be spending around 5 or 6 hours total – but they’re easily broken up over several game nights. T.I.M.E. Stories is light on mechanics, so it’s easy to pick up quickly. The rulebook is primarily concerned with making sure players understand movement and skill check rules; most other rules are spelled out on the cards that make up scenario decks. The rulebook is digestible in around 30 minutes, and you’ll be error-free in your first game. Teaching is similarly easy, requiring only a summary of movement and skill check rules picked up from the rulebook. Around 5 minutes with a new player and you’re ready to start. T.I.M.E. Stories is playable with 2, 3 or 4 players, and I’ve covered each player count in the first three scenarios. Surprisingly, I’ve found it plays equally great at each. The rulebook gives you pause by stating that the game’s intended interaction will work much better with 4 than fewer, but I’ve found that to be false. With two players you’ll be managing two investigators apiece; with three you’ll be managing one (playing with one fewer investigator than other player counts), but you’ll get a well-balanced bonus that evens things out. You’ll obviously have fewer people to brainstorm with in a 2-player game, but I didn’t find that to be detrimental at all. Without getting into specifics to avoid spoiling anything, T.I.M.E. Stories is not for children or pre-teens. In addition to time travel, horror is the constant theme through the first three scenarios – and it can get pretty close to R-rated. Pictures on cards are rife with scary imagery, while written materials can be very adult. While the rules could be easily digested and followed by an 8-year-old, I won’t be playing this with my kids until they’re 15 or so (and a decade between playing a scenario will be necessary as you’ll need to forget everything before trying to replay). The two closest comparisons for T.I.M.E. Stories I’ve come across are Agents of SMERSH and Tales of the Arabian Nights. While each of those titles are decently-replayable choose-your-own-adventure games with hundreds of pages of options allowing you to piece together different stories every time you play, T.I.M.E. Stories has exactly one path – and you’ll need to expose at least 80% of the story to complete a scenario. It’s a zero-replayability game, but I find it much more engaging than other storytelling games. There is almost no middle ground for T.I.M.E. Stories – outside of Legacy games, there’s nothing you can purchase that will get fewer plays, which we can all agree is a bad thing. However, I’ve yet to find another game as engaging when you’re in it. When you fail a run, you will think about nothing else until you get to attempt the next run. You’ll work on solving puzzles for hours between play sessions. And when you unravel the mystery to get to the end you’ll feel genuine accomplishment. Unlike Legacy games, you’ll do nothing to harm or otherwise change any of the game materials in T.I.M.E. Stories. Theoretically, you could finish a scenario with one group and begin playing with another. But it doesn’t work that way, as the “game” is in trying to graduate from “wandering aimlessly around talking to weirdos” to piecing together the correct path of rooms to visit and objects to collect to get to the end in the allotted time. Once you’ve learned this – as well as the solutions to all of the puzzles you’ll encounter along the way – you’ll remember them for the foreseeable future. If another group were to attempt to play it with you involved, it would be cheating. So you play for 5(ish) hours, then you put it away until the next expansion comes along – and you pay another $20 for that new scenario (just a new deck of 120 to 150 story cards). If being completely captivated (and borderline obsessed) for 5 hours is worth $35 to you ($20 for each additional 5 hours), T.I.M.E. Stories can’t miss. If you’re less worried with story/theme, and prefer mastering game mechanics through dozens of plays, this is a definite pass. Overall, T.I.M.E. Stories is one of the best cooperative games I’ve played, and one of my favorite games ever. Let me start out by hitting up the reply value here. It’s a star higher, because I’m including the fact that you’re only going to be playing the base scenario one time fully. You might be running through it 3 or 4 times to get the full run, but after that, there’s no real point. However, I believe that since you’re going to be using the base set to play additional scenarios (sort of an episodic content model) it still gets that additional star. On top of that, you COULD assist in moderating the game for a different group of people. I feel like watching the reactions and thought processes of another group as they go through it would be nearly as interesting as playing it for yourself. I enjoyed the writing, and while I found a few of the game elements to be frustrating at times, it was still a superb experience for working through with friends. I do wish that there was a training scenario that you could run that would give you a bit of a better idea for what you should be keeping an eye out for, or how the system works a little better rather than feeling like you’re going into that first scenario unprepared. Thematically, that’s still solid, as you’re supposed to be fresh out of the academy. I enjoyed choose your own adventure books when I was younger, and this is sort of a riff on that. There’s variability and randomness added in both the time die that determines the amount of time that it takes for you to traverse locations, and in the amount of time and dice luck that it’ll take you to tackle any of the individual challenges. Most of the brain part of it is deciding who remembers certain facts, and where certain things are, so that when you’re going to have to run it again, that you’ll be able to streamline your run. Beyond that, the rules were easy to learn, and there were very few things we had to look up after getting into the groove. Personally, I tried to make sure that everyone was on the same page and knew the rules as well as we could before tackling it, knowing that we’d only have one real chance to play through it fully. The box does an excellent job at storing the components if you’re going to pause play, or need to move the game in media res. I think that one of the best arguments for the lack of true replay-ability in this game is that it’s one of the few games in existence that you could actually divide up the cost of and split between players. Everyone can chip in on the chance to play a new scenario. You’re sort of buying a seat at the table for the experience. And that, for me, works. This is hands down my top game for 2015, and I’m looking forward each new scenario that is slated to come out next year. Let me start by saying this is a great game. My game group recently added this to our collection and had a blast playing it. Briefly, the game casts the players as TIME agents sent back in time to prevent a temporal catastrophe. In this case, the setting is an asylum in the 1920s. You team must investigate the area and follow the clues to find who or what is causing the disaster. If you can’t succeed within a set time, you’re pulled back to the future and have to try again from the beginning. The base mechanic of the game is fresh and interesting. As you enter new areas a mural of cards is laid out. The players investigate by picking up the cards that show an point of interest for them, reading the back, and relaying that information to the group. The game encourages players to reframe information they find in their own words which creates a kind of shared storytelling element of the game. The scenario deck contains many of these murals that ******** out as the players explore the setting. The game has one of the better cooperative engines I’ve played and doesn’t immediately fall into the trap of having one person taking the lead at the expense of other players. The game is challenging without feeling overwhelming. You really feel the pressure as the clock ticks down and you rush to get as much information as you can. The scenario that comes in the box is intriguing and fun. I won’t ruin the surprise by going into too much detail, but the creepy vibe of an old time asylum comes through really nicely. The biggest drawback of the game is that it only comes with one scenario. My group played three times without completing the adventure and we might have a session or two left. I understand that the game could not present a tight, well-crafted story without this format. It would have been nice if it had come packaged with a second scenario, though. That limitation may be a deal breaker, especially if you’re a gamer with a budget. There currently 3 or 4 more scenarios and my group digs the game, so I’m sure we’ll collectively invest in the expansions. Please keep in mind that my review is somewhat bias because one perspective in mind. So let’s just enjoy the ride. The first time I heard this game’s concept, I couldn’t resist to like it. But upon learning how the game really played, a fear grows on me. The game has a bit of legacy element on it, not entirely similar but the feel. The game offers element of surprise in each case, which in one of the main appeals of the game. Players play as time travel agents, trying to fix a case in the past or more likely to catch a bad guy who escaped to the past. During the game players will solve riddles, puzzles, find clues and complete the mission eventually. These so-called agents will take the roles of the characters living in that present time (past for these agents) and each of them has different stats and abilities, interesting. They will be given a specific amount of time to complete their mission before they’re back into the future. The game is designed with the idea that by collecting clues and interesting finds, they will do better with these resources in the next try. It’s the main potential with time travelling if you can do something over and over again. Eventually you will reach perfection based on the chances and mistakes you’ve done. Players will explore different locations, meet different people and get various clues. If they fail, they can attempt to try it again from the start, but the next attempt should be better and more efficient based on information they managed to get from previous attempts. But once the mission is solved, players are done, they play with another mission. This complete mission will no longer ‘playable’, the term ‘playable’ here is that once it’s completed the mission is no longer serve the same purpose as it’s before. Unless players trying to find out other ways to deal the mission. So I guess once you complete the mission, you no longer play it again, move on to the next case, which you need to acquire since cases are sold separately. Yes the base game only has one case. This is a problem for me. I don’t really like the idea of getting a game where I can only play it a number of times and then be done with it. So it just stay quietly on my shelf forever (until I forget all of the case and can re-play it again) or sell it. I am more of a person who keeps a game that he likes. I tried the game once and figured that the game wasn’t worth to be in my collection for this reason. There you go. Once the game is over, it is over! 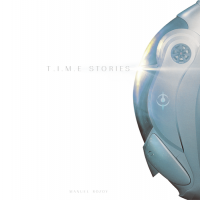 Add a Review for "T.I.M.E Stories"